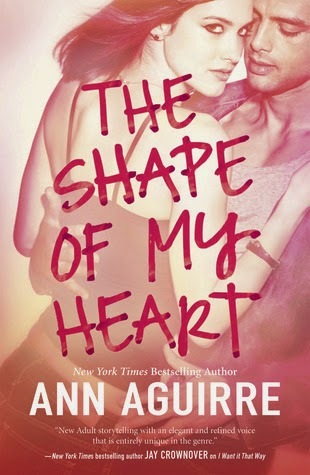 I've loved every book in the 2B Trilogy, and The Shape of My Heart was the perfect ending to this steamy series. (Read my reviews of I Want it That Way here and As Long As You Love Me here). I didn't expect to like Courtney as much as I did. She was so honest, so real, that I was drawn to her. I loved her outlook on life, "take me as I am." Courtney knows who she is and isn't ashamed of it. In that respect, I was surprised at how much I grew to love Max. I thought I knew who he was from the previous books. Imagine my surprise when he was totally different from the 'surface' Max I was introduced to in books one and two. Ann Aguirre has written this series so well. The books feel fresh, the pace moves quickly, and the romance is so well-written. I love the love stories and the conclusions are good but not saccharine. I am so pleased with this series and look forward to reading more of Aguirre's contemporary fiction!